We have begun to destroy the beauty of this creek. It will no longer run clear between its banks, covered with wattles and tea-trees, and amongst its shallow parts overgrown with foreign-looking shrubs, flags, and cypress-grass. A little while, and its whole course will exhibit nothing but nakedness, and heaps of gravel and mud. We diggers are horribly destructive of the picturesque. Keesing, N 1971, History of the Australian gold rushes, by those who were there, O'Neil, Hawthorn, Vic. In this context the word 'diggers' refers to men digging for gold during the Victorian gold rush. The same word also came to refer to soldiers from World War I, and Australian soldiers in general. Deep lead mining involved digging for gold in riverbeds deep below the surface. Miners soon went from small parties of friends to larger cooperatives. Eventually mining companies were the only ones with the resources to follow the deep leads. 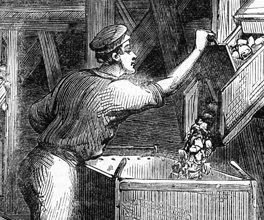 Reef mining took place across Victoria from the 1850s until World War I, and involved digging deep shafts to find veins of gold-bearing quartz. Steam engines were needed to pump water from deep underground and run the quartz stamp batteries. The quartz was crushed to powder, and chemicals – such as mercury and arsenic – were used to extract the gold dust. The leftover crushed rocks were then dumped over the ground or tipped into creeks. As miners went deeper underground mining became more dangerous. The disaster at Creswick in 1882 saw the loss of 22 miners when a shaft flooded. More recently in 2006, three gold miners were trapped at Beaconsfield in Tasmania. After two weeks spent more than a kilometre underground, two of the three men were rescued. Sluice mining was carried out until the 1950s, and involved firing a stream of high-pressure water against riverbanks or any other ground where there was gold. The water washed away soil, rocks and vegetation, and left behind vast areas of land polluted with the toxic chemicals used to extract the finer gold particles. Huge areas, such as the Thompson River dam in Gippsland, were mined in this way. Gold recovery is one of the most intensive mining processes in the world. Mining can be profitable even if only a few grams are present in each ton of rock. Huge open-pit mines, like Western Australia's 'Super Pit' in Kalgoorlie, now dominate the industry and make Australia one of the top five gold producers in the world. Gold mining has many economic benefits for the state, and is undergoing a revival in regional Victoria. But more than a century of mining has taken its toll on the Victorian landscape, and these economic benefits must be weighed against the potential dangers to our environment. Worldwide, concerns for the environment have led to a 'No Dirty Gold' campaign, pointing out the waste of processing up to 250 tons of ore to extract the gold required for a single wedding ring.